I bought Beholder’s Eye earlier this year, in April in fact, right after Little Red Reviewer had Julie E Czerneda as a guest on her blog to promote her latest Web Shifters book. (It’s a really good post, which you can read here if you’re interested). Hmmm, you don’t seem as impressed as you should be. I’ll say that again with more emphasis: this book I’ve just read was bought this year. I just read something in the same year that I bought it! This never happens! Be impressed (you can pretend – I’ll not know)!! J It normally takes me a good five years, at least, to dig out and read something I was extremely excited about at the time of purchase. Heck, if you’re not impressed I am! 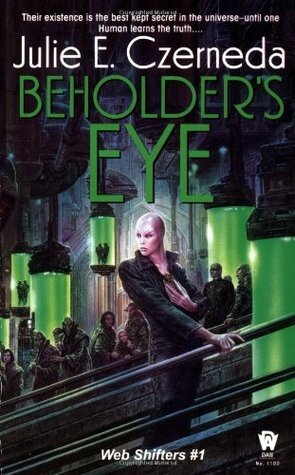 Esen-alit-Quar is the 500-year-young shapeshifter heroine of Beholder’s Eye. She is impetuous and brave, affectionate and curious, and quite unlike the five other much, much older members of her Web (or biological family). On her very first assignment she breaks one of the Web’s cardinal rules by revealing her true nature to a human, a First Contact officer called Paul Ragem, and the book is as much about the calamitous consequences of this as it is about the beginnings of their extraordinary friendship. Both the book, and Esen, are an absolute blast. Because being an extremely long-lived shapeshifter opens up the universe for you like nothing else, so what do you do with yourself? Esen’s Web, under the guidance of their oldest member/sort-of-mother Ersh, seeks out and preserves intelligence. They learn both the fundamental biological structure of (and how to shapeshift into) a species, and everything they can of its culture, primarily by living as one of the observed species for a loooong time. The Web is, in effect, a living library of species knowledge and everything learned by an individual is periodically shared between all members (by simultaneously eating and being eaten by each other – so cool! Who needs flash drives and clouds, eh? Hmm, or books for that matter … OK, I see a problem …). Reading a book from the point of view of a being that can perfectly become another species, and take on that species’ characteristics and instincts but still retain a core self was just the most fun. With a brilliant imagination and a background in biology Czerneda’s aliens are so much more than conveniently humanoid beings with extra appendages. Esen experiences life as a canine-like Lanivarian (able to comfortably walk on both four legs and two), an amorphous Ycl, a giant, furry and vocally-challenged Crougk, an extremely tactile, long-limbed Ket, and, my absolute favourite, a bovine Ganthor, with an incredibly strong herd instinct and a very smelly method of communication. That’s perhaps what has left the most lasting impression on me after reading this, that each of the alien species Czerneda creates feels like the product of a completely different set of rules to those of humanity. They feel alien. They can be analogous to something on Earth – the Panacians, for example, are insect-like, and their culture and outlook reflects that quite vividly – or they can be utterly unrecognisable, like the Web itself, in all its blue teardrop-shaped glory. But either way, through Esen we get to see what it might be like to be something other than ourselves. She casually remarks when in Ket form that there are parts of the spectrum she cannot see, and food is pretty tasteless, but the texture of a fabric seat cover beneath her extremely sensitive hands envelopes her almost entirely in sensual delight. As a tiny Quebit she is absorbed by the finest details, like loose panel fittings and badly laid carpet, and no longer feels fear or any kind of concern over the future. As a Ganthor that smelly, rowdy group of mercenaries over there becomes her herd, efficiently and eloquently reasoning via their language of chemical signals that she should rejoin them for safety and strength, occasionally punctuating their argument with pushing, shoving and stamping. It’s funny and clever and thought-provoking all at the same time. It’s a book that also explores relationships – two in particular. Esen’s child-parent (for want of a better descriptor) relationship with Ersh is important to the whole movement of the story. Like a child, which she is to the others of her Web, she fears Ersh’s anger when she does something wrong, and yet still backchats her elder quite happily. She clearly looks up to and respects Ersh, and later in the story is discomforted to discover her elder is not as peerless as she had believed. She essentially moves from childhood (or rather her teenage years, I suppose) to adulthood over the course of the story, learning that even Ersh is fallible and coming to trust her own judgement. Without really giving anything away, I really liked Esen’s decision about her Web’s purpose at the end and how it reflected her nature, more active and curious (and outward-looking?) than her Web-sisters. The other great relationship here is between Esen and Paul. Linguistics and Alien Culture Specialist Paul Ragem is just about as Star Trek as they come. He’s good-hearted, open-minded, brave, endlessly curious, respectful of other cultures and species (naturally), and a tenacious friend. His knack for recognising Esen no matter her exterior is pretty impressive, and a sure sign that he can be trusted, which is just as well since he already knows the one secret Esen’s not supposed to tell anyone. They make a great pair, mutually interested and interesting, both ready to step outside their comfort zones and make sacrifices to preserve their friendship. And, huge plus, this friendship doesn’t go romance-shaped at any point. They seem to be equally fascinated by each other, and certainly there is the beginnings of a real and abiding affection, but Czerneda neatly shuts down the possibility of that becoming anything more. For that alone I’d read books two and three, but I genuinely want to know how things will pan out for them. Will they remain friends (the blink of an eye – assuming she has one at the time – for her, a lifetime for him)? What scrapes could they possibly get into next that would top what they’ve already been through? And how might their dynamic change over Paul’s lifetime? Good for you! Wait to read those books! I just finished my second Czerneda book, so I’m not nearly as enthused as I would have been after just one of her books. I’m beginning to sense that she’s a very “relationial” author even if not on the far end of the romance spectrum. So I am glad that kind of writing works so well for you. None of this waiting business…. 😀 I agree, boo to waiting! great review! isn’t Esen so much fun? This sounds like a blast! Another one for the pile😊 Thanks for the review! I’d love to send you a copy of Julie’s newest book! Please email me at acerocdawpublicity@gmail.com! I love, love, love your review of this book! Julie Czerneda is one of my very favorite authors and this book has always been one of my long time favorites!